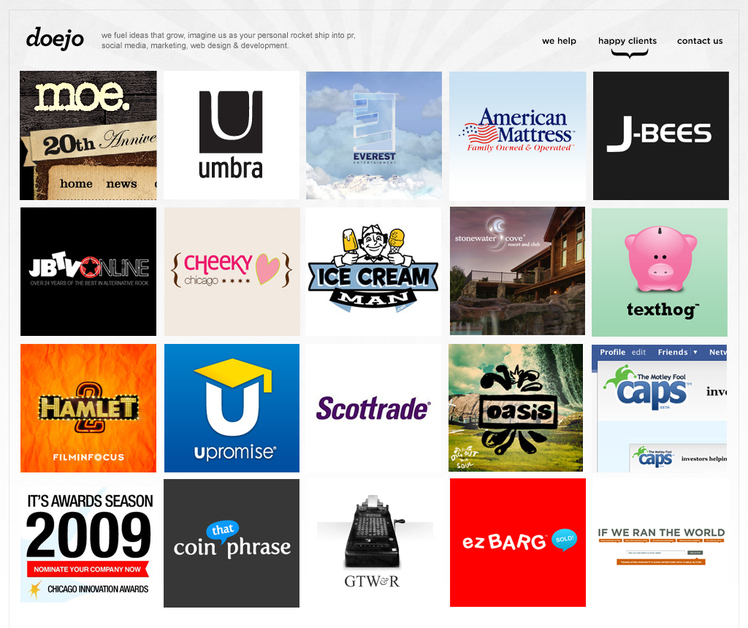 Doejo is a full service digital agency headquartered in Chicago. We provide branding, identity, integrated marketing, social media strategy, art direction, web design & development, startup incubation, commercial video production, product development, and commercial storefront development services to a wide array of clients, ranging from bootstrapped startups to Fortune 500 companies. Our clients include Braintree, Groupon, State Farm, Lightbank, New World Ventures, TechWeek, Umbra, Tribeca Flashpoint Academy, Greater>Than, and Consequence of Sound. For the past 5 years, Doejo has operated almost exclusively under the radar, out of coffee shops owned by Doejo’s Founder, Phil Tadros. This has enabled us to expand quickly, without overhead, and launch close to 250 web properties in under two years. We’re deeply rooted in the tech startup community in Chicago and abroad, and have great relationships with emerging seed funds, VCs, startup founders, and collegiate entrepreneurs. As our reputation for affordable, high-quality, design and development services has grown, Doejo has been profiled in TechCrunch, Wall Street Journal, Fast Company the NYT, on CNBC, FOX News, The Washington Post, PCWorld, and Mashable. With regards to web development, Doejo uses the Agile Development Methodology, which is a framework for software engineering that promotes development iterations throughout the life-cycle of the project. Agile development minimizes risk by developing software in short amounts of time. Software developed during one unit of time is referred to as an iteration, which may last from one to four weeks. Each iteration is an entire software project: including planning, requirements analysis, design, coding, testing, and documentation. An iteration goal is to have an available release (without bugs) at the end of each iteration where both our team in tandem with your team re-evaluates project priorities. Agile methods emphasize daily communication over written documents. At a minimum, this includes programmers and their "customers" (customers define the product; they may be product managers, business analysts, or the end clients). We discover, build, launch, and grow ideas. Our projects are guided by best practices, collaboration and momentum. We’re definitely scrappy, and we fight for our projects. By treating each engagement as a partnership, we fully invest ourselves in the success of our clients. By focusing on this simple process, we’ve successfully launched hundreds of products, brands, sites, and campaigns for ourselves and our clients.